Mrs. Pauline was selected as the GGUSD teacher of the month for October! We are so honored to have such dedicated teachers! Congratulations Mrs. Pauline, we love you! 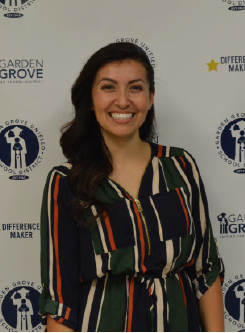 Anabel Pauline began working in the GGUSD in 2018 as the Choir Director and Life After High School teacher at Los Amigos High School. She was nominated for this recognition by a student who said, “Mrs. Pauline is the light and the love that saved our choir program. She is an inspiration to me and my fellow Lobos.” The student said that Mrs. Pauline led a prominent show choir to victory and added four concerts to the schedule to provide students with more opportunities to perform. She also organized fundraisers, competitions, festivals and other performances that have made each student feel extremely special. Anabel said her favorite thing about her job is empowering students to reach their greatest potential through their musical experiences together. She said the ability to watch students transform into young professionals who rise to the occasion inspires her to do the same as their teacher. Congratulations Ms. Pauline, we love you!